Peter Parker: Brilliant, but Lazy. "I made a choice once to live a life of responsibility. A life she can never be a part of. Who am I? I'm Spider-Man, given a job to do. And I'm Peter Parker, and I too have a job." 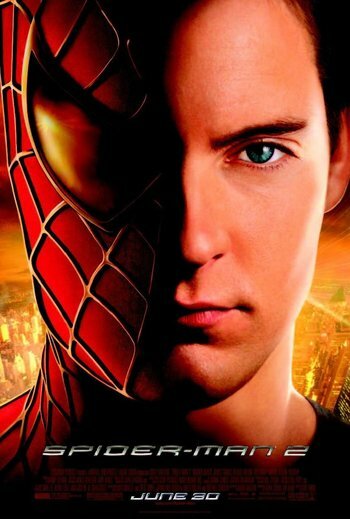 The second entry in the Spider-Man Trilogy, this sequel to Spider-Man was released in 2004. Peter Parker is struggling to find balance in his life, as the increasing burden of being a superhero gets in the way of his relationship with his studies, job, friends, family, and the woman he loves. Once the stress begins to affect his powers, he decides to give up being Spider-Man once and for all. This comes at a bad time, since the brilliant scientist Dr. Otto Octavius (Alfred Molina) is caught in a Freak Lab Accident that not only kills his wife, but also leaves four mechanical tentacles permanently attached to him. Going insane, he becomes the evil "Doctor Octopus" and is determined to retry the failed experiment on a much bigger scale—For Science!, of course. With the city in danger and his relationship with Mary Jane in doubt, Peter is forced to "get back to work". Academy Award: The film won for Best Visual Effects, and was further nominated for Best Sound Editing and Best Sound Mixing. Aesop Amnesia: J.Jameson just came to realize that Spider-Man was indeed a hero, up until he found out that Spider-Man stole his suit back and starts hating him again. Ageless Birthday Episode: Peter is thrown a surprise birthday party without any mention of his age. However, since his aunt May mentioned that his uncle's murder was 2 years ago, we can assume that Peter is 19 or 20. A.I. Is a Crapshoot: The tentacles - they tend to do things that protect themselves and Octavius, but are extremely twisted in their ways, and are more keen to destroy in order to get what Otto wants rather than anything else. Alas, Poor Villain: Doctor Octopus, who dies destroying his fusion machine so that it won't destroy New York. The Alleged House: Peter Parker's apartment is one of these. It's small, it's ugly, and the door sticks. Presumably this is because he went with the cheapest option, being stuck in Perpetual Poverty (not that it stops Mr. Ditkovich from taking most of the money Peter can get). When Spider-Man shows up at Doctor Octavius' failed experiment, Harry assumes he's the reason why it failed. Doc Ock thinks he's helping Aunt May by giving her a quick death, rather than a slow one of old age. The arms speak to Doctor Octopus. They even regard him as a father, something omitted from the film. The closest it ever gets to that in the movie is when Doc Ock says he hears voices inside his head. They also say things like Spidey interfered in his experiment because he was jealous of Otto's success. Uncle Ben appears to Peter frequently, rather than a single dream sequence in the movie. The name of the usher played by Bruce Campbell is Waldo. His scene with Peter was originally longer - Peter would web Waldo's foot to the floor, and go in to see MJ's play just as it was coming to an end. When Doc Ock tries to rob the bank and Peter abandons Aunt May, she assumes that the reason he runs away is to call the police, rather than out of cowardice. The lift scene initially had Spider-Man sharing it with a whole crowd of people, and not just one person. When Peter tells the man he made the suit himself, the novelization tells us he got it from the brother of The Flying Dutchman, the rival wrestler of Bone-Saw, who Peter fought in the first film. He offered his services after Peter beat up Bone-Saw. The police couldn't confirm Uncle Ben's murderer because there were no eyewitnesses. Peter couldn't come forward because of his involvement. In the opening scene, when Peter is late for his pizza delivery job because of a disturbance, we learn that the disturbance came from a man at a construction site nearly crushed by a falling girder. Mary-Jane met John Jameson at Enrique's, the diner she worked at in the first film. A trucker pinched her bottom and she dumped a plate of spaghetti in his lap. When Enrique demanded she apologize, she was thinking of caving in when John stepped in. His car battery had died, and he was waiting for a tow-truck. He pretended to be an FBI agent causing Enrique to back down, and MJ quit her job. They started seeing each other not long after. Mary-Jane's parents have split up since the first film. Apparently Mr. Watson has changed slightly since the divorce. MJ's line "You can't get off if you never got on" sounded suggestive in her mind. When Peter goes to see a doctor, it's at the university's student health services department. His name is Dr Wally Davis, and he's more emotional in the book. He even sees a therapist. Instead of stealing the money to fund his experiment, Doctor Octopus broke into classified government installations for what he needed. They couldn't risk exposure so they couldn't argue. The tentacles also tapped into an illegal power hookup. Peter muses that all the women in his life wind up dangling from a ledge sometime, e.g. Aunt May taken hostage by Doc Ock, and Mary Jane during the Green Goblin's attack on Times Square. It also bothers Peter that he always takes pictures of MJ with other men, in the case of John more so, because he hasn't done half of the heroic things Peter has done, and he's still celebrated as a hero, while Spider-Man is demonized by the press. Although Jameson is ecstatic that Spider-Man has given up, in the novelization he's secretly not that happy about it, because Spider-Man sells more copies of the Bugle than any other celebrity, and now that he's gone, sales figures have gone into a tailspin. When Peter goes to get his suit back, he was secretly listening to Jameson's eulogy before he took it. Apparently, Jameson had it dry-cleaned so it felt better than ever. Apparently when Peter was a young boy, he distrusted his Aunt May after his mother died. But in the reconciliation scene, he begins to wonder if May knows his secret. In that same scene, because he moves a desk with ease, that's what prompts him to try and jump the gap between two buildings, thinking his powers have returned. He doesn't fall on a car, though. Aunt May begins to blame herself for Uncle Ben's death in the film, but in the novelization, Peter wonders is it because Ben is haunting her as well, especially now he's given up Spider-Man. When he confesses his part in Uncle Ben's death, May tells him to leave instead of just getting up and going to her room in silence as she does in the film. What kills Doctor Octopus is when he drowns his experiment, it super-heats the water, broiling him alive. He also goes blind by staring into the eye of the ball of energy without his protective goggles. The tentacles express sheer terror at the thought of dying as they desperately beg for their "father" to save them, not realizing that he's already dead. Peter rents above a TV repair shop. He doesn't live with Harry anymore since Norman's death, and Harry moved back into his father's townhouse. Harry's obsession with Spider-Man was too much for Peter to bear. This is the reason why he gets annoyed with Harry at his birthday party. Doc Ock tapped Peter's phone lines. That was how he knew he'd find him at a café with Mary-Jane. The reason MJ is so annoyed that Peter missed her play is because he was the one who encouraged her acting ability. Harry wonders if Quest, Oscorp's biggest rival, hired Spider-Man to discredit his company. Hoffman is the ad manager for the Daily Bugle. This is why Jameson is always asking him to patent names for super villains invented by the Bugle. The third film more firmly established this on-camera. Betty Brant ensures the garbageman is paid more for the Spidey suit than Jameson was willing to shell out. In a scene omitted from the film but restored in the extended cut, the night staff at the Bugle say that Jameson wears the suit, striking mock heroic poses when he thinks no-one's watching. He even walks onto his desk, sticking paper clips to a lamp like it were webbing. Also, the DA's office want the suit to verify it's the real thing, but Jameson won't hear of it. MJ confesses to Louise she's marrying John to prove something to her father, and to show Peter what he's missed out on. The planetarium party Jameson's hosting is to raise money for the new library of science. Part of what fuels Harry's depression is the scientists who witnessed the failed fusion experiment were thinking of suing Harry, because it was funded by Oscorp's money. It also bothers him to see MJ with another man, just like Peter. Alternative Foreign Theme Song: The Japanese version uses a song called "Web of Night" by T.M. Revolution for the theme song. Anti-Climactic Unmasking: Played straight and then averted. When Peter takes off his mask on the train, the passengers don't know who he is. The second and third time it's taken off, Harry, Dr. Octavius, and Mary Jane recognize him. Anti-Villain: Dr. Octopus. Now, when he's bad, he's really bad. But his whole nature is still so tragic, and he does redeem himself in the end. Armor-Piercing Question: When Harry confronts Peter about Spider-Man at the beginning of the movie. Peter: I want us to be friends, Harry. I want us to be honest with each other. Harry: Then be honest with me: If you knew who he was, would you tell me? Artistic License  Biology: The cerebellum, to which Octavius's arms are linked, is a processing center for balance and coordination. Their AI shouldn't have had the means to communicate with Octavius's consciousness or skew his emotions, because it's only motor-related regions of the (conscious) cerebrum that interact with the cerebellum, not its sensory regions or limbic system. Artistic License  Geography: The train fight between Spidey and Doc Ock takes place on an elevated line in Manhattan, when in reality, all of the elevated lines south of 125th Street were dismantled by the 1950s. The sequence itself was actually filmed in Chicago as their 'L' system still has extensive elevated trackage downtown. Despite dressing up a train of old 2200 series cars and refitting some 'L' stations with appropriate signage, station platform signs for Clark / Lake on the Green, Brown, Pink, Orange and Purple Lines are visible as the two foes are getting their footing. Nuclear fusion really is the process by which the sun generates energy. But a nuclear fusion reactor won't look like the sun unless it's as big as the sun (over a million kilometers across). The reason the sun has prominences and a photosphere and sunspots and all the rest is because there are thousands upon thousands of kilometers of hot gas that aren't undergoing nuclear fusion, sitting on top of the core and obscuring it from view. And, worse, the reactor in the movies doesn't just look like the sun, it looks like the sun filmed in X-ray light and shown in false color so that we mere humans can see its surface structure. No one except Ock is even wearing glasses to protect their eyes from that sun, though it should have rendered them blind in minutes. On top of that, you'd think that dipping a small sun into a large body of water to quench it down would provoke a devastating explosion of steam, if not outright plasma from all the ionized hydrogen and oxygen. And there's no possible way that a fusion reactor would start pulling in everything in the room that isn't nailed down. If the rationale was gravity, see Sci-Fi Writers Have No Sense of Scale. If the rationale was magnetism, see Selective Magnetism. Tritium really is an important part of fusion reactions, but it's a gas, a special form of hydrogen; the golden crystalline substance shown in the film will make anyone who knows anything about tritium go "...huh?" When Peter is rescuing the baby from the burning building, there is no smoke from the fire, when there should be black smoke billowing out the windows. He wouldn't be able to just stand up and walk through the building. But in order for the scene to play out on camera, the area is smoke free. A fire in an apartment or office building will include combusting of large amounts of plastics (computers and so on). So unless there is nothing but alcohols in the building there will be immense amounts of smoke pouring out the windows. As pointed out in this video , after Doc Ock throws Spider-Man forward on the train, Spidey somehow slows down in midair so he can tackle Ock from behind. Badass Bystander: Everyone in the train when they rise up against Octavius to protect Spider-Man... they don't succeed, but it takes some stones to stand up to a villain with four mechanical arms. Peter does this earlier in the film, when sans powers, he runs into a burning building to rescue a trapped child. He gets her out safely, but unfortunately, then finds out that there was someone else trapped on the fourth floor that died. Bad Vibrations: Octavius generally makes his presence known by loud thuds from his tentacles long before he shows himself. Bank Toaster: A Morally Bankrupt Banker, on top of denying Aunt May and Peter Parker a loan, denies them a coupon for a free toaster, because of a certain minimum deposit that is required. "Be Quiet!" Nudge: When Peter and Aunt May are at a bank discussing with the teller about their account, Peter actually mentions May's piano lessons. May tries to shut him up by kicking him under the table, but misses and kicks the bank teller instead. Big "NO! ": Octavius lets out a particularly narmful out when he sees the murder and destruction his tentacles have wreaked while he was unconscious, and then lets another one out as he is dragged underwater with his overloading fusion machine. The second one manages to be fairly tragic, as he had just made his HeelFace Turn and his last comment was a pledge not to die a monster, with his "NO!" reaffirming this as he sacrifices his life. Peter gets his own narmful one later on, when he sees M.J. is about to be flattened. Harry too, when the hallucination of his father screams at him to avenge him. Bilingual Bonus: Right after Peter successfully dodges Mr. Ditkovich while on his way to MJ's play, Mr. Ditkovich turns and says in Russian to Ursula, "Idiot! Why are guys like that even born?" Bittersweet Ending: The film seems like it's about to end on a happy note. Peter has gotten his powers back and he finally gets together with the girl of his dreams. When danger calls, she tells him "Go get 'em, tiger," showing her approval of him being Spider-Man. He goes out to be a hero. But then the movie ends lingering on MJ's face as it becomes solemn, looking sad and uncertain. Also, there's the whole thing about his (former) best friend finding out he's Spider-Man (the man he blames for his father's death) and discovering his father's Green Goblin gear. Blade Below the Shoulder: Octavius's tentacles have a blade inside them. Which is odd, if you think about it, since the tentacles were built for experiments, not combat. Bloodless Carnage: Noticeable, a part of making the movie Lighter and Softer, especially where Otto's octopus arms are rampaging. Bond One-Liner: To make a temporary escape from Spidey, Octavius uses one of his tentacles to open up the train's throttle to maximum speed, then rips it out and tosses the handle to Spidey. Breaking the Bonds: When Peter wakes up after being unmasked by Harry, he breaks the cords Doc Ock used without much effort. Brilliant, but Lazy: Trope Namer, as used by Octavius when talking to Peter right before the tritium project. Call-Back: In the first film, Spider-Man attempts to save a woman from a burning building, but it turns out to be Green Goblin wrapped in a blanket and shrieking in falsetto. In this film, Peter - temporarily powerless - braves another burning building to save a child who is wrapped in a blanket, which happens to be green. Get it? There are several scenes like this that act as callbacks to the first film, and Raimi plays with these callbacks by altering the scene being referenced for dramatic irony, comedic subversion, etc. Casual Danger Dialog: In the final scene, where Peter is unmasked and rushes to save MJ from a falling object. Mary Jane Watson: [somewhat disbelieving] Hi. Peter Parker: [beat] This is really heavy. Conspicuous Trenchcoat: Octavius uses one to hide his tentacles when he robs the bank. To be fair, it's the only reasonable way that would be capable of hiding his tentacles completely. Continuity Cameo: Dr. Curt Connors appears as Peter's professor (the one who threatens to fail him for being Brilliant, but Lazy). Crucified Hero Shot: When Spider-Man is pulling back the train, and then after he falls unconscious. Cut the Juice: Spider-Man does so in order to stop Dr. Octavius' disastrous first experiment. Cybernetics Eat Your Soul: Octavius' tentacles take over his mind. Damsel out of Distress: Aunt May, of all people! When she is captured by Octavius in the building wall fight, she makes sure he knows that she's not going down without a fight by smashing the end of her umbrella into his face. Sure, Never Mess with Granny, indeed. Digital Destruction: The color grading on the film's Blu-ray is drastically different from how it looked in its original theatrical release as well as on DVD, though this was later fixed in the 4K Ultra HD release. JJJ is finally convinced that Spider-Man is a hero and was really fighting for the good guys this entire time... up until Spidey takes back his superhero suit from JJJ's office, causing him to accuse Spider-Man of being a thief, which is funny, given that Jonah scammed the goddamn suit off the guy who found it. That may have also been relief that their relationship could return to normal again. Peter's emotional crisis causes him to lose his web-shooting ability. But don't worry. It happens to a lot of guys. Also "You can't get off if you don't get on." When MJ is telling Peter they can't just pick up where they left off. Double Take: JJJ does one when he yells "HOFFMAN! ", only for Hoffman to pop up right next him. Dragged by the Collar: Played to horrific effect when one of Otto Octavius' tentacles drags away a screaming doctor despite her futile attempts to cling onto the floor with her nails, leaving behind a screeching trail of scratch marks into the dark background to which she is being dragged away. Dramedy: The film is a very personal coming-of-age story, but also has plenty of laugh-out-loud moments. Drowning My Sorrows: Harry Osborn, after Octavius' fusion demonstration (financed by Oscorp) malfunctions. Dying as Yourself: Octavius will not die a monster. Early-Bird Cameo: Gwen Stacy is mentioned in the novelization as a classmate of Peter's. Three years later, she's on screen as just that. Even Evil Has Standards: Octavius manages to get Spider-Man weakened enough that the citizens attempt to pull a Go Through Me to protect the latter. Instead of simply slaughtering or harming them, he affably opts to push them out of his way to focus on Spider-Man instead. Granted, this is right after Doc-Ock nearly got everyone on said train killed in the first place, but having to do the deed personally was likely not something he wanted to do. Evil Brit: Averted. Alfred Molina is English, but played Otto with an American accent so as not to make him too Obviously Evil. Even then, Molina's native accent does slip through at times. Evil Hand: The tentacles have an advanced AI. Family-Unfriendly Death: Averted, with the death of Mrs. Octavius. Jagged glass flew at her at incredible speeds, and yet Otto found an intact, wholly recognizable body. On the other hand, while the exact fate of the last nurse Doc Ock dragged under the table is not shown, one has a feeling she isn't screaming in fear of being knocked out. Famous Last Words: "I will not die a monster!" Foreshadowing: "My Rosie's dead... my dream is dead... and these monstrous things should be at the bottom of the river... along with me." When a Daily Bugle newspaper flies at the screen after Peter steals his costume back from Jameson, one of the other news items in the top right corner reads, "MTA Insider concerned over aging El-Train Safety." This immediately leads into Spidey and Ock's train fight. Forgot About His Powers: Doc Ock fights Spiderman by grabbing him with his robot tentacles and slamming him into walls and such. A few moments later it's revealed that at least one of those tentacles contained a long retractable blade he could have easily stabbed the web slinger with. He goes into a single sling with this blade, misses, and never uses it again. Freud Was Right: It should come as no surprise that many viewers see Peters inability to produce his sticky, white webbing due to his stress and frustration as one big metaphor for impotence. Since the web-shooters are organic here rather than mechanical, it's definitely intentional on Raimi's part. Glad I Thought of It: JJ "christening" Dr. Octopus. Go Through Me: The train passengers try to protect Peter from Octavius. They fail. Hand Wave: A real fusion reactor would kill people in such close proximity to the reaction, but this is skimmed over to create more dramatic situations and justify Doc Ock's tentacle arms. HeelFace Turn: After Dr. Octopus discovers Spider-Man is Peter Parker. Held Gaze: Peter and Mary Jane continually throughout the movie. In one notable instance that Doc Ock destroys, their mutual Held Gaze presages an Almost Kiss. He's Back: Subverted once, although it was easy to see coming, and then played straight. And this Daily Bugle headline says it all ◊. Holding Out for a Hero: After Peter quits being Spider-Man, crime on New York City increases by 75%. Wow. How Do I Shot Web? : Appropriately enough. In this case, it involves trying to scale an alleyway, but this ends with him spraining his back. I Call Her "Vera": Alfred Molina gave pet names for the four mechanical tentacles. Harry and Larry were the bottom two, Moe was the top right one and Flo was the top left one. Ignored Epiphany: Jameson was about to admit that he was wrong about Spider-Man after the latter's absence. When Spider-Man gets his Powers back, he changes his speech in mid-sentance, going back to his usual demeanor. J. Jonah Jameson: Spider-Man...was a hero. I just couldn't see it. He was a...[looks to see that Spider-Man has stolen back the suit]...A THIEF! A CRIMINAL! He stole my suit! He's a menace to the entire city! I want the wall-crawling arachnid PROSECUTED! I want him strung up by his web! I WANT SPIDER-MAN!!! I Have This Friend...: Peter recounting his loss of powers about his... sorry, his friend's dream of being Spider-Man and losing his powers to his doctor. "I Know You're in There Somewhere" Fight: Peter takes off his mask and gives one of these speeches to Dr. Octavius encouraging him to resist the control of his tentacles. This is followed by Otto telling his tentacles "Listen to me now!". Ironic Birthday: Peter's birthday party counts as it comes the same day he gets fired from his pizza delivery job. Ironic Echo: In a blink-and-you-miss-it shot, after Peter tries to maintain a "strong focus on what I want" and jump from one building to another, his powers give out in midair and he comes crashing to the ground, and throws his back out... and we see that the car he landed on was a Ford Focus. Octavious' assessment of Peter as "Brilliant, but Lazy". Just Train Wrong: How do we describe the train fight? Aside from parts of the 1 train north of 116th street, all subway lines in Manhattan are buried undergroundnote There used to be elevated lines, but these were all buried or demolished by the 1950s. The train is signed as an R train. The tracks shown in the movie dead-end in Lower Manhattan. The real R train never goes above ground, unless service disruptions reroute it over the Manhattan Bridge, and its termini are in Queens and Brooklyn. There are no New York City Subway cars in active service that have blinker doors. All cars on the active fleet have sliding doors. Even if there were blinker door cars, they'd have to be paired with a set of cars that have sliding doors to maintain ADA compliance. 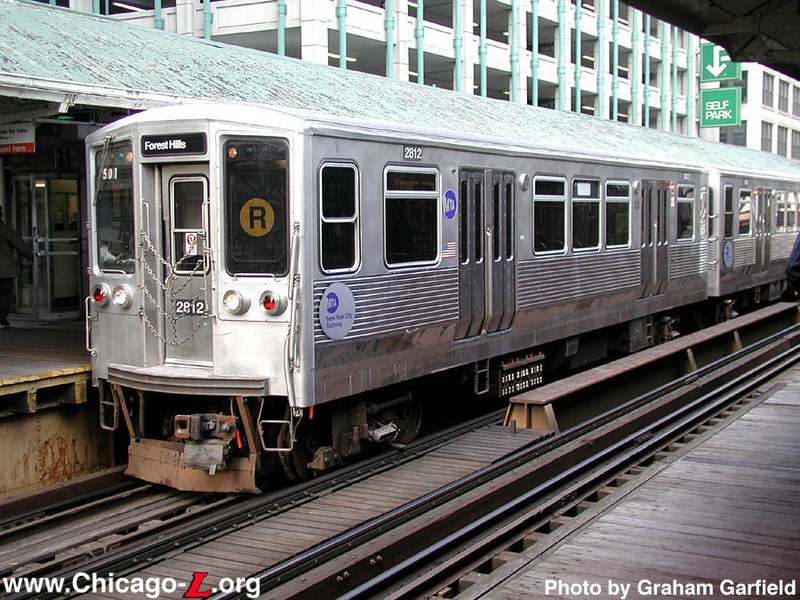 For the record, the sequence itself was actually shot on the Chicago 'L' system, using a train of (now-retired) 2200 series cars. Lampshade Hanging: J. Jonah Jameson does one about Ock's Meaningful Name: "Guy named Otto Octavius winds up with eight limbs. What are the odds?" Last-Second Chance: Dr. Octopus at the end. Laugh of Love: Mary-Jane is laughing happily as she runs to Peter's place in her wedding dress, as she's realised that he's the one she truly loves. Lighter and Softer: The movie has a lot less blood than the previous film. Made of Iron: Considering his lack of super-strength, Dr. Octavius survives quite a pummeling in all of his fight scenes with Spider-Man. In addition to the blows from Spidey's super-powered fists, he also gets smashed against a taxi hard enough to dent it and falls 20 stories onto an 'L' train car, all with no injuries. Not to mention simply hauling around the weight of those arms so much of the time without falling over. Well in the comics they are first made out of Adamantium, which is noted to be monsterously strong but also very lightweight, his next set were made of a titanium-steel-niobium, which is a superalloy. which at least the Titanium-nobium parts are used in MRI machines. "Well, say something..." is first said by Aunt May to Peter when he walks in on his surprise birthday party. The line is later repeated at the end of the film, this time with much more emotional significance, when Mary Jane says it to Peter, after stating that she wants be with him regardless of the potential risks. Peter uses Aunt May's words of encouragement to himself in an attempt to make Doc Ock snap out of it and help him stop the fusion reactor. It works. Peter: Sometimes... to do what's right... we have to be steady... and give up the things we want the most... Even our dreams. Meaningful Name: A guy named Otto Octavius winds up with eight limbs. What are the odds? Money Mauling: When Spider-Man confronts Doctor Octopus while he's robbing a bank, the two of them attack each other by throwing bags of cash at each other, with Spidey webbing one of the bags back at Doc Ock with the wisecrack "Here's your change!" Mood Whiplash: The extremely touching scene on the train where the passengers discover Spider-Man is just a kid is suddenly interrupted by Doc Ock busting in and yelling "HE'S MINE!" Morality Chip: On the robotic arms. Predictably, it gets destroyed. Morally Ambiguous Doctorate: Dr. Octopus. Morally Bankrupt Banker: On top of denying Aunt May and Peter Parker a loan, he denies them a coupon for a free toaster. Later on, during the battle in the bank, he tries to swipe one of the gold coins flying around until Aunt May, who could really use it, slaps it out of his hand with a "shame-on-you" look. Multi-Armed Multitasking: Dr. Octopus does this when he builds the new sun-generator machine, with his long metallic tentacles. Possibly, with Dr. Octopus holding Aunt May hostage. In the earlier comics, May (true to form at the time) was blissfully unaware that Dr. Octopus was a bad man, in this movie however, it's pretty clear. The famous "Spider-Man No More" ◊ panel is paid homage to when Peter ditches his Spider-Man costume. The story's title also appears in dialog and as the subsequent Bugle headline. Likewise, Peter holding up a wall from Octavius' collapsing lair is reminiscent of Spidey lifting up rubble from Octavius' collapsing lair in issue #33 of ''The Amazing Spider-Man'' ◊. The fact that Otto Octavius/Doc Ock was someone Peter that personally knew was from Spider-Man: The Animated Series. Never Mess with Granny: Aunt May, especially when she has an umbrella. Never My Fault: Doctor Octavious is convinced that Spider-Man is responsible for his wife's death when it was really his own experiment that got her killed. Noodle Incident: When the garbageman brings in the Spidey suit, J. Jonah Jameson's reaction is "Don't tell me you have the head of an extraterrestrial, 'cause if you do, you're the third one this week." No OSHA Compliance: Doctor Octavius is conducting his revolutionary fusion energy experiments in a New York penthouse and there is no shielding of any kind between it and the audience. Not So Different: The butler compares Harry to his dad. Bernard: Your father only obsessed over his work. The Obstructive Love Interest: Mary-Jane. A nice group example of the snared up police car, seconds before "...it's a web!!" After the planetarium party, Spider-Man has one when his web fails mid-swing. He ends up crash-landing in an alleyway. Peter has a wide-eyed one midway through his "I'm back" jump, right before he plummets several stories into an alleyway and lands hard on a car, injuring his back. OUCH. Omnidisciplinary Scientist: Octavius is a brilliant nuclear physicist who has nearly perfected a viable source of infinite power from nuclear fusion. On the way, he has also made revolutionary breakthroughs in robotics and software engineering to create his intelligent arms. Not only that, but he must have developed an extremely effective power source even before the fusion reactor just to power the extremely strong arms. The Paragon: Aunt May points out to Peter that Spider-Man is a symbol of hope to people who are in the face of despair and that you trust him when he tells you to hold on for just a minute longer, and that even the boy across the street wants to be Spider-Man when he grows up. This saves Peter at the end when the people on the train rally against Octavius to protect an unconscious Peter, seeing him unmasked and realising that the hero putting himself in harms way to save them is "just a kid, no older than my son". Harry tells Doc Ock that in order to find Spider-Man he must find Peter first. Doc Ock somehow finds Peter with Mary Jane in a random cafe and throws a car through the window straight at them. Any normal man would've been killed instantly, and Doc Ock doesn't know that Peter is Spider-Man. Given that Peter is his only lead on Spider-Man, it makes no sense that Doc Ock would effectively try to kill him. Near the film's climax, Spider-Man asks Harry to tell him the location of Doc Ock's hideout so he can save MJ and the city. Which Harry does. But how did Harry know where Doc Ock's hideout was in the first place? Doc Ock never tells him and there's no evidence he's been keeping tabs on Ock. Post-Victory Collapse: A very moving one after Spider-Man stops the runaway train and is kept from falling by the very people he just rescued. Unfortunately he's in no condition to fight off Doc Ock again when he arrives to kidnap him afterward. Psychosomatic Superpower Outage: Peter loses his powers due to being subconsciously conflicted about whether or not to keep being Spider-Man. Psychotic Smirk: Harry, probably by now using his father's dodgy human performance enhancers has a bit of one when he's briefly shown at the ceremony of Mary-Jane and John's would-be wedding. Peter gets dismissed from Joe's Pizza due to tardiness being a ground for workplace termination. The train passengers tell Doc Ock he'll have to go through them to get at him. He agrees and shoves them all aside with his super strong robotic arms. It looks like Spidey could get a You Can Barely Stand moment however he's far too weak after having stopped the train, and is knocked out by a single hit to the head. The reasons why Peter had to retire from the life of a superhero. Due to his secret life, he had skipped classes, had unfinished schoolwork and was nearly expelled because of it. Being a hero is all well and good, but, you still need to think about supporting yourself in the future or actually getting a job. Reality Is Unrealistic: The reason the scene in which Jameson parades around in the Spider-Suit was taken out. It turns out that J.K. Simmons actually was athletic enough to fit the suit without it looking silly. Re-Cut: An extended cut of the film, titled Spider-Man 2.1, was released in 2007. The cut contains 8 minutes of extra scenes, as well as some alternate takes of scenes that were in the theatrical cut (such as the elevator scene, a scene of J. Jonah Jameson romping around on his desk in the Spider-Man suit, or some extra footage in the train fight). Recycled Soundtrack: Some of the music was reused from the first film. In tandem with some of Danny Elfman's score being reworked or replaced by cues written by John Debney (who later did his own Marvel movie), Deborah Lurie, Christopher Young and others (Elfman's original music for the runaway train scene is on the score album, the version in the film is redone by Young), Elfman was so pissed off that he refused to come back for the third movie and didn't work with Sam Raimi again for several years. Redemption Equals Death: Dr. Octavius has to drag the reactor with him into the river to stop it from destroying New York. Doc Ock: I will not die a monster! Red Sock Ruins the Laundry: In a quick scene, Peter Parker ruins his whites by washing them in the same load as his Spider-Man costume. Repeated Cue, Tardy Response: Mary Jane notices Peter sitting in the crowd at her play, and is distracted causing her to miss her cue. The stage manager is just off stage repeatedly whispering "I AM GLAD" to try and cue her line. Rooftop Confrontation: Subverted. A fight between Spider-Man and Octavius begins on the roof of a building, but they end up chasing each other all over the city. Runaway Bride: MJ leaves a note to let the groom know he's been abandoned at the altar. Shaky P.O.V. Cam: It's a Sam Raimi movie, what did you expect?! Hoffman mentions "Doctor Strange" as a potential name for Doc Ock. Jameson admits that it's good..."but it's taken." It would end up taking twelve years for a Doctor Strange movie to finally back Jameson up. In the hospital scene, the lunging POV shot from the sensors on the tentacles is reminiscent of the POV of the "Evil" in Evil Dead. A side view of one of the tentacles zooming toward a screaming woman also mimics the "flying eye" gag in Evil Dead 2. Octavius's appearance at the cafe, where a series of loud stomps from his tentacles precedes his appearance, echoes the first appearance of the T-rex from Jurassic Park. Sinister Shades: The ones Otto wears when he abducts Mary Jane. Skyward Scream: Jonah bellows "I WANT SPIDER-MAN!" when Spidey steals back his suit. Society Marches On: In this day and age, unmasked Spider-Man on the train would probably gain a few of the passengers posting a photo of him on social media. Theme Music Power-Up: Variation- a triumphant reprise of the movie theme plays as soon as Peter's glasses hit the floor after Peter gets his powers back, signifying that at last, He's Back. 30 Minutes, or It's Free! : Given that a pizza order at Joe's Pizza becomes free after 29 minutes, thus losing the restaurant money and potential repeat customers, Peter's supervisor Rahi Aziz treats the 29-minute guarantee as a serious matter. As such, Aziz understandably dismisses Peter when he is once again unable to make his pizza deliveries on time. This Is Your Brain on Evil: Dr. Octopus suffers this as he slides further and further into villainy. Too Dumb to Live: Dr. Octavius, we know you have incredible confidence in your machine, but at the same time, did you ever stop to think that maybe conducting a test on an experimental fusion reactor in New York City - where there are over 20 million people - was not an incredibly wise decision? And this was before you went crazy? Train Stopping: Peter uses webs as a stretch net to brake the train to a stop. Funny enough, it actually becomes Truth in Television about 10 years later from a research conducted. Apparently, using the webs to stop the train can actually work . Traintop Battle: Including a runaway train. If any irony, the entire train fight is a case of Chicago doubling, as the scene was filmed on Chicago's 'L' system: the only elevated tracks in the Manhattan portion of the subway are parts of the 1 train in Upper Manhattan. Furthermore, the trains have fold-in doors ◊, when New York City Subway cars that are currently used in revenue service have sliding doors. Uncomfortable Elevator Moment: Provides the page image. One of the funniest examples too. An alternate version happens in the extended cut. Under the Truck: Spidey is chasing two crooks in a car and naturally, a truck pulls out in the way. Rather than slide under, Spidey swings through the gap between the cab and trailer. Unobtainium: Oscorp's tritium. Although it is an unusual example, since tritium is a real substance and is used in some fusion experiments. However, real tritium is nothing like the substance portrayed in the movie, and it effectively functions as Unobtainium that just happens to have a semi-accurate name. Villain Team-Up: Played with. For different reasons Doctor Octopus (consistent thwarting) and Harry Osborn (misguided vengeance) have a common enemy in Spider-Man, so they form a loose alliance. Harry may only commit villainous acts toward Spidey, but his deal with Otto knowingly puts the entire city in mortal danger. Visual Gag: A subtle one. In the scene where Peter is trying to get his powers back, he tells himself "focus on what you want." After jumping off a building, but then failing and falling to the ground, landing on a car, as he gets up, he is standing next to a parked Ford Focus, with the word Focus clearly in the shot. Walking Shirtless Scene: Doctor Octopus, thanks to the way those arms are stuck on him. What Could Possibly Go Wrong? with that nuclear experiment? When Things Spin, Science Happens: The reactor. You Killed My Father: The reason Harry wants revenge on Spider-Man. He even says it, word-for-word, towards the end of the film.